And doubtless yet more overprints, it'll be like like the Trucial States issue quantities before we know it. Postally used (on piece) will be the only way to collect Post and Go to avoid being dragged onto the new issue treadmill. Has Guernsey missed the (mail-) boat? 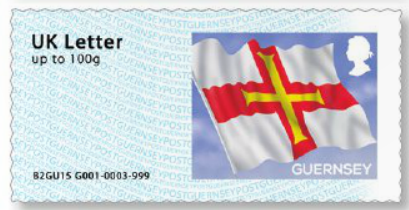 It will be interesting to see how Guernsey “deal” with Post & Go, will they follow a conservative approach as Royal Mail initially did (Stampex, Perth) or will they follow Jersey lead and have an overprint virtually every month. As the machine will have four stamp printers, we know one will have the Guernsey Flag, we suspect one will have the Union Flag from Royal Mail (it probably a gap in my knowledge, but I didn’t think Guernsey Post sold RM stamps, unlike Jersey who have been known to accept RM stamps as postage from the Island), an Alderney Issue no doubt and the Jersey Flag perhaps. On the other hand IoM may see this as a way of closing more post offices, if they install machines in shops, pubs and the airport, as An Post has in Ireland. Ian, I think you are completely correct. While we stamp collectors are aware of "Post And Go" stamps because of their initial philatelic promotion at exhibitions and museums the real purpose of the machines that dispense them are practical - a means of providing stamps to the public without the expense of involving a human in the sale or even of going to the expense of providing a physical site for the dispensing machine since they can just as easily be sited in a shop not owned or run by the Post Office. The Isle Of Man already has "Pay And Post" machines sited in soon-to-close post offices and privately owned supermarkets so it does not seem unreasonable to foresee that the IOM Postal Administration may chose "Post And Go" kiosks to dispense some of their machine-printed stamps particularly as they would provide some revenue from philatelic sales. Presumably in the coming years more and more stamps which are actually intended for use on mail rather than as collectibles will be sold by machines rather than humans and if collectors of "postage stamps" are discerning about what they buy they will continue to be able to form interesting, affordable and satisfying stamp collections that continue to tell the story of the development of postal services in all the British islands. "Without the expense of involving a human"? Every time I go to my Post Office for Post and Go stamps, there's a human fixing one of the machines! These humans are, I suspect paid considerably more than the ones behind the counter! I've collected all GB new issues complete up to end of 2014 (both GB special issues and varieties, P&Gs including overprints and Jersey). I'm drawing my line now! I do love the pictorial P&Gs but the overprints just look boring in an album. Will draw a very tight line from now on based on my favourites - probably only Prestige Books, P&G basic collector's packs, retail books maybe? Not decided yet - saying that I might get a Guernsey P&G set and the P&G sailing set looks lovely! Note to self - New Year resolution - hard line on Royal Mail new issues! (Tried last year and failed!) Less of a pleasure and more of a pressure/stress nowadays and costing a fortune! And customer service at Tallents House is pretty appalling so it's crunch time for me. We are definitely moving into the era of the discerning collector I think (and RM should think about that). Although you've posted this as a comment here on the Guernsey thread, I think it is of sufficient interest to get it's own discussion so I'll repost it as a new 'guest blog'. No discussion on the annual program here, thank you everybody. New post coming imminently. The details are in the Philatelic Newsletter on page 10 – 11 & back cover.